UNITED NATIONS, Mar 8 2017 (IPS) - The United Nations has frequently been accused of vociferously preaching gender empowerment and women’s rights to the outside world — but failing miserably to practice what it preaches in its own political backyard. The charge is usually made against the 193-member General Assembly, which has elected only three women as presidents – Vijaya Lakshmi Pandit of India (1953), Angie Brooks of Liberia (1969) and Sheikha Haya Rashed Al-Khalifa of Bahrain (2006). And that’s three out of 71 Presidents, 68 of whom were men. The 15-member Security Council’s track record is probably worse because it has continued to elect men as UN Secretaries-General, rubber-stamped by the General Assembly, and most recently late last year– despite several outstanding women candidates. And that’s zero out of nine male UN chiefs (Trygve Lie of Norway, Dag Hammarskjold of Sweden, U. Thant of Burma (now Myanmar), Kurt Waldheim of Austria, Javier Perez de Cuellar of Peru, Boutros Boutros-Ghali of Egypt, Kofi Annan of Ghana, Ban Ki-moon of South Korea and, currently, Antonio Guterres of Portugal). The two highest ranking political positions at the UN– one of them with the status of a head of state in terms of diplomatic protocol– have long been identified as the intellectual birth right of men. The General Assembly, the highest policy making body at the United Nations, and the Security Council, the most powerful veto-wielding body in the Organization, have continued to overwhelmingly opt for men over women during the 71-year existence of the world body. And still, both UN organs continue to relentlessly—and hypocritically– pay lip service to the cause of women’s rights and gender empowerment in the endless debates on life’s inequalities. On the other hand, the UN Secretariat and 35 of its affiliated agencies worldwide have been labouring, with limited success, to implement a longstanding UN resolution which has called for 50:50 gender parity between men and women – and specifically on senior high-ranking, decision-making jobs. As the UN commemorated its annual International Women’s Day on March 8, a recently-released 36-page study on the “Status of Women in the UN System” focuses on where the 50:50 gender parity stands – and where it falters. 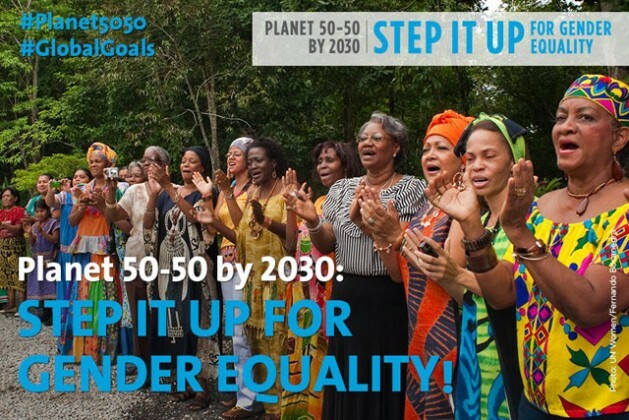 “Equality is not a statistic,” she rightly declares, “It is a mindset” – even as the UN has launched a campaign to achieve 50:50 gender party in all walks of life worldwide by the year 2030. On the UN’s current payroll are a staggering 94,000 staffers and 78,000 consultants worldwide. The UN staff is largely divided into two categories: the General Service, which includes mostly the clerical staff and secretaries, and the Professional Service (equivalent to an executive staff in the private sector). The Professionals move up the ladder as P-1, P-2, P-3, P-4 and P-5 rising to “Director” levels D-1 and D-2 and theoretically vying for the posts of Assistant-Secretary-General (rarely achievable), Under-Secretary-General (very rarely achievable) and Deputy Secretary-General (never). The three most senior positions in the UN hierarchy — ASGs, USGs, and DSGs– are mostly appointments made by the Secretary-General, primarily caving into political pressure by the big powers at the UN. As laid down in the UN staff regulations and staff rules, the authority for the selection of staff members at D-2 level and above rests with the Secretary-General, including the retention of staff members beyond the retirement age, should the need arise. According to the study, only five out of 35 UN “entities” have reached the 50:50 parity and beyond: UN Women (78.9 percent), International Court of Justice (57.1 percent), UNAIDS (50.8 percent), the UN Educational, Scientific and Cultural Organisation (50.6 percent) and the UN World Tourism Organisation (50 percent). Listed on a scale are 17 other UN entities with 40-49 percent parities, including the Secretariat, and 13 UN entities with 40 percent parities. “As the largest entity in the UN System, the UN Secretariat (in New York) has the potential to greatly impact overall system progress towards 50:50 gender balance. However, the UN Secretariat has a lower representation of women at every level than the overall UN System,” says the study. “A negative correlation exists between the representation of women and seniority – as grade levels increase, the proportion of women decreases. The sharpest declines occur between the P-2 and P-3, and P-4 and P-5 levels, with drops of 12.2 and 5.9 percentage points, respectively. Such decreases indicate there are blockages in the pipeline hindering the career advancement of women within the UN,” the study notes. While Guterres would have a pivotal role in achieving gender parity, she said, “we cannot rely on him alone”. The Member States have a key role to pay in nominating women candidates to key UN positions. Civil society has an equally critical role in proposing criteria for selection; or recommending individuals who have the expertise and track record on women’s empowerment, women’s rights and gender equality, she added. In some of his initial appointments last January, Guterres named several women to senior UN positions, including Amina J. Mohammed of Nigeria as his Deputy; Ambassador Maria Luiza Ribeiro Viotti of Brazil as his Chef de Cabinet; Kyung-wha Kang of South Korea as his Transition Team Chief; Melissa Fleming of the United States as his Senior Advisor/Spokesperson; and Michelle Gyles-McDonnough of Jamaica as Senior Advisor. Sanam Naraghi-Anderlini, co-founder and Executive Director of International Civil Society Action Network (ICAN) told IPS that in a world with an increasing number of women in tertiary education and in the workplace, it seems inconceivable that the UN has not or cannot reach parity between women and men in all levels across the system. “These may sound like large numbers but look around the world of civil society, the private sector, and many governments — the women are present, ready and willing,” she pointed out. But the question is how would the system deal with the very human realities? In this case, she argued, today’s generation of men in existing posts, with hopes and expectations of moving up the ladder – will have to experience the glass ceiling that generations of women have faced in the past. If parity is to be a reality, many of today’s male P4s, P5s, D1s, D2s, USGs will be paying the price for the many earlier generations of men who advanced and filled those posts — often regardless of their abilities, said Naraghi-Anderlini, the first Senior Expert on Gender and Inclusion on the UN’s Mediation Standby Team. Ian Richards, President, Coordinating Committee of International Staff Unions and Associations described the study as “a comprehensive report” on the status of women in the UN system. Richards said one area the report doesn’t examine but should, is the 30 percent of the UN workforce that is made up of consultants. He said their fees are negotiated individually with managers, instead of being set by a salary scale, and there has been no study of whether women and men are paid the same for equivalent work. Finally it’s interesting to note that in the International Civil Service Commission (ICSC), which sets conditions of service and decides against providing assistance for childcare, only two of its 15 members are women, he pointed out. Cabrera-Balleza said she was pleased about Guterres’ appointment of women in top level UN positions. “I am also happy to see that on the call for nomination of candidates for Under Secretary-General positions, the UN Secretariat stated that it would especially welcome nomination of women candidates”. “However, I am disappointed that the qualifications for those positions do not include track record on gender equality. The call only states “high commitment to the values and guiding principles of the UN and familiarity with the UN system…” Track record on gender equality should be explicit. It should be explicit during recruitment and hiring; and it should be explicit in Terms of Reference for all UN officials. It cannot and should not be assumed,” she declared. “We should also bear in mind that advancing the status of women and achieving gender equality in the UN system is not just a numbers game. We need to have women and men who represent women’s interests; who fight for women’s rights–not just their own self interest or self advancement. Hence, we need track record; and not just commitment. Anyone can claim commitment to women’s rights and gender equality but only few have track record,” she added. Naraghi-Anderlini said to be perfectly fair, it would seem the UN needs to up its recruitment of junior men in P1 and P2 positions to ensure parity at the base too. So parity will also benefit a younger generation of men, alongside the multi-generations of women who could fill the more senior posts. In an ideal world, she said, the Secretary-General would take on this challenge and focus on ensuring that the very best of women and men enter, remain and advance in the system across all levels. “They must all adhere to the core UN values – of equal human rights, pluralism and peace. But the skills and knowledge required, should be as varied and diverse as the societies in which the UN seeks to be present and effective,” said Naraghi-Anderlini. “Imagine what a UN that would be? Probably the best place in the world to work in,” she added.